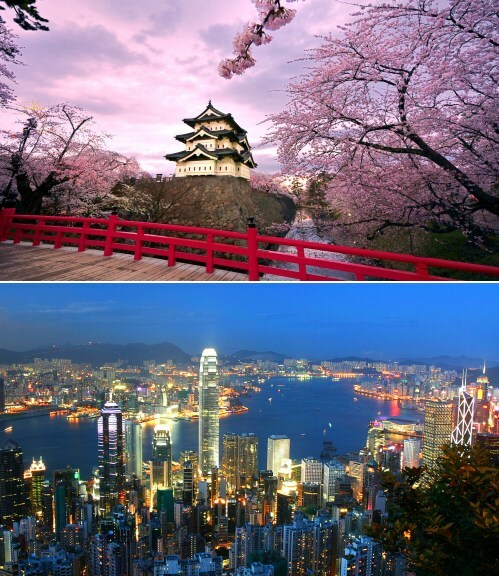 An amazing multi-city flight deal just became available for travel from Winnipeg to Hong Kong (HKG) to Tokyo, Japan (NRT) and then back to Winnipeg, all for just $674 roundtrip including taxes. Yes, that's right. All 3 flights, for about half the typical price of a normal roundtrip flight to either one of these destinations. You can spend time in each place, such as one week in Hong Kong, and then one week in Tokyo. The flights use a combination of United Airlines and ANA. The example searches are for 1 passenger. When you get to FlightHub, you can click on 'More Options' to restart the search, and search for 2 passengers. The example searches are for 1 week in each place (1 week in Hong Kong, 1 week in Tokyo). You can try your own search for longer stays, but you should probably focus on Wed flights for the best results. When you get to FlightHub you can click on 'More Options' to try different dates. There seem to be a handful of 2016 dates available. The March one is the latest in 2016 that I've seen it available for. The March one is also interesting because that's a pretty good month to visit both Hong Kong and Tokyo. 2. Complete your booking on FlightHub. 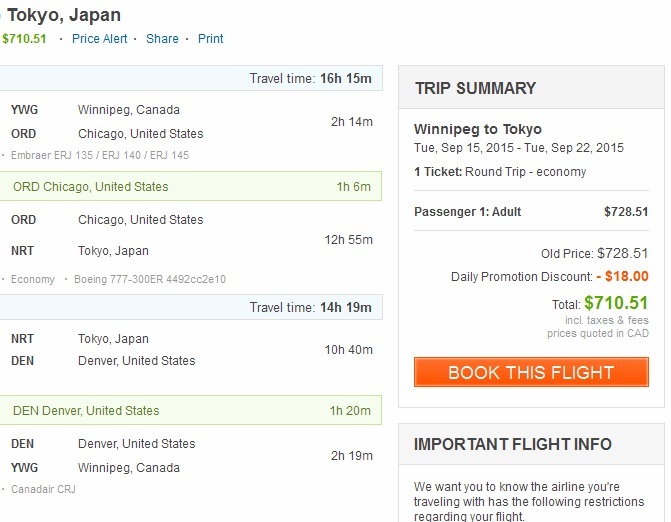 Winnipeg to just Tokyo, $710 roundtrip including taxes. There are also some regular roundtrip flights available from Winnipeg to Tokyo, Japan for $710 roundtrip including taxes, which is a pretty amazing price on it's own. When you get to FlightHub, click on 'More Options' to modify the dates. Try dates in September, October, November 2015 or January, February, March, April 2016. Focus on Tuesday to Tuesday flights for the best chance of success. The trip can be one week, two weeks, three weeks, etc. 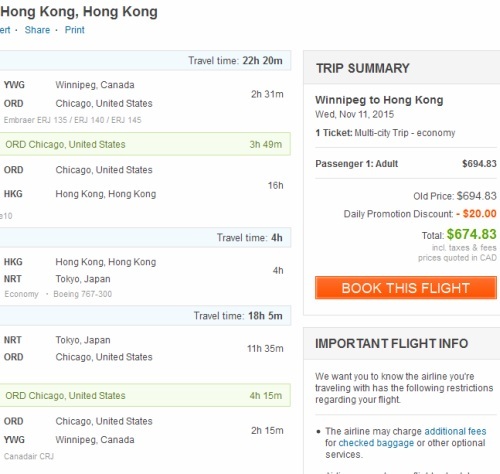 Winnipeg to just Hong Kong, $588 roundtrip including taxes. winnipeg, ywg, flight deals, tokyo, japan, nrt, asia, east asia, united airlines, hong kong, hkg and ana all nippon airways. 15 Responses to "Winnipeg to Hong Kong to Tokyo, Japan and then back to Winnipeg - all for just $674 after taxes"
When I click on the links the prices I see are much higher then what you are showing both for the multi city and single city trips. Amazing deal - but the deal is only good for 2 people. The single traveler gets screwed again! BAH! Lester: Can you clarify what you mean? All of the example links are for 1 passenger. If anything, the single traveler would have an advantage in this case, if there were only one ticket remaining at the cheap price. It seems like 95 percent of people are having no trouble viewing the lower prices, but there seems to be 5 percent that are only seeing higher prices. I'm trying to figure out what the reason is, it might have to do with the person viewing the regular website version versus the mobile version of FlightHub. For the record, I'm using the regular website version when checking the links. Thanks for looking into this Chris! I'm on the regular site and I can only see the deal when I select 2 or more people. When I select one person the price is around $1400. Thanks Lester, that's definitely unusual, I'll take a look at that. Susan: Yes, FlightHub is the only place I've seen these. The consensus on FlightHub, from what I've seen across Canada, is that they're fine for getting your ticket issued from the airline, but are bad at customer service. So, as long as you don't anticipate needing to make any changes to your ticket down the road, all should be fine. But if you do see yourself needing to make changes, their phone support is pretty bad. Also remember that they try to charge you $20 for 'same day cancellation insurance' by default, which is pretty lame, since most third party booking sites and airlines offer 24 hour cancellation for free. If you don't take the 'same day cancellation' insurance, they will try to charge you a lot if you need to cancel within 24 hours. (The same as most every place would if you tried to cancel *after* 24 hours). So the bottom line is, if you're certain it's the flight you want, and don't foresee yourself needing to make adjustments later, they're ok to use. Lester: What dates are you trying when you can only see it when you select 2 or more people? Thanks for the info on Flighthub, Chris. Can you explain (or theorize) why these deals are available only through Flighthub? I didn't realize that an online travel agent could have exclusive access to special prices. It's very rare these days, but I do see cases where a price can only be found with one specific online travel agency. It's hard to tell for sure, but I'm guessing these are usually consolidator fares. And also, strangely, this week I booked a flight on Air Berlin that was $160 on Cheapoair.ca and over $400 on the Air Berlin site. Same here, I cannot find the pricess advertised either. These ones lasted until about 6 PM EST on May 22nd before the prices changed back. It was a pretty popular one that went pretty quickly, as it was available from Vancouver, Calgary, and Edmonton, in addition to Winnipeg. I'll definitely let everyone know if any more appear! Sometimes they do come back.